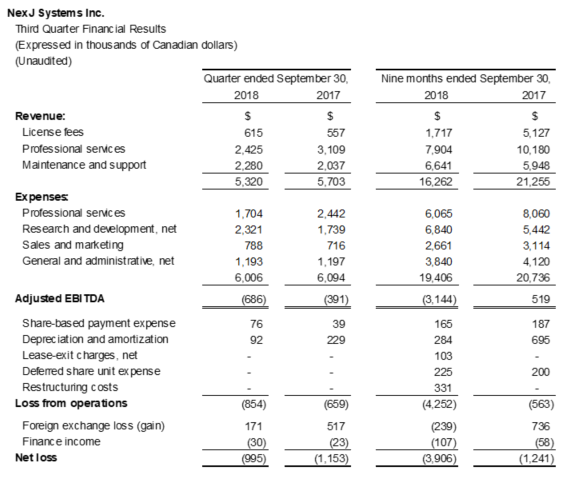 NexJ Systems Reports Third Quarter 2018 Results — NexJ Systems Inc.
Toronto (October 25, 2018) — NexJ Systems Inc. (TSX: NXJ), a provider of intelligent customer management solutions to the financial services industry, today announced financial results for its third quarter ended September 30, 2018. “I am encouraged that our focus on customer retention and acquisition has led to an increase in revenue over last quarter, however, our goal remains to return to year-over-year revenue growth”, said Paul O’Donnell, CEO, NexJ Systems Inc. “We fully expect the incremental sales opportunities we are seeing will yield more positive results going forward”. NexJ will be hosting an earnings report conference call on October 25, 2018 at 5:00 p.m. ET. The call can be accessed via webcast or by phone by dialing 1-888-390-0605 (North America Toll Free). Investors should dial in approximately 10 minutes before the teleconference is scheduled to begin. A replay of the call will be available beginning on October 25, 2018 at 8:00 p.m. ET through 11:59 p.m. on November 1, 2018 and can be accessed by dialing toll-free at 1-888-390-0541 and using password 405716. The term “Adjusted EBITDA” refers to net income (loss) before adjusting for share-based payment expense, depreciation and amortization, lease-exit charges, net, deferred share unit expense, restructuring costs, foreign exchange gain (loss), finance income, finance costs, and income taxes. “Adjusted EBITDA margin” refers to the percentage that Adjusted EBITDA for any period represents as a portion of total revenue for that period. NexJ Systems is a provider of Intelligent Customer Management solutions for the financial services industry. Individually, NexJ’s award winning products use artificial intelligence to improve customer service and increase advisor and banker productivity. Together, the Intelligent Customer Management suite delivers a continuously-learning, cognitive application that recommends the right intelligence-augmented actions for users to deliver personalized customer service at scale and grow their business.